Two years a I posted on Waste Heat as a major source of warming. Last year I noted that the counties with shrinking populations are cooler. Now there is a major paper on waste heat. The greenhouse effect isn’t the only thing warming things up. There is also the waste heat released when we generate and use energy – even clean energy. Yet the regional impact of that heat – which moves from warm buildings, engines and power plants into the world around us – has not been well accounted for. A new study now shows waste heat may explain some temperature variations at a national scale better than do global climate change models. Generating and using energy produces waste heat that warms the environment. National energy consumption can be reflected in national temperature variations, according to a new study. “This is a major source of climate change that has not been looked at,” said John Murray of The Open University in Milton Keynes, England and lead author of the new study accepted for publication in Earth’s Future, a journal of the American Geophysical Union. “Any kind of energy consumption generates heat” Murray said. To tease apart the waste heat signal, Murray and co-author Douglas Heggie of the University of Edinburgh compared national temperatures in Japan and the United Kingdom with global temperature trends and with energy consumption from 1965 to 2013. They focused on Japan and the U.K. because as island nations, they are more isolated than mainland countries and more likely to stew in their own waste heat. The researchers found that for both countries, waste heat explains national climate variations: national temperatures track better with energy use than with global temperature trends. The data showed a correlation between a temperature drop in the U.K. and the current economic recession, which has caused a reduction in energy use there, Murray said. The study also found Japan’s steadily growing energy consumption parallels the worldwide increase in carbon dioxide levels. The scientists caution that both countries are rather extreme cases: Japan has the 8th highest mean energy consumption in the world and the U.K. has the 13th. Of the two nations, Japan has a warmer climate and therefore less need to heat buildings. Britain, on the other hand, shows a more pronounced local temperature variation, being a cold enough place to require indoor heating for about six months each year. There is also more cloud cover in the U.K. than in Japan, and those clouds hold waste heat closer to the ground, where it can raise the temperature. “The correlation of temperature above background levels and national energy consumption is very high,” concluded Murray. This suggests that energy consumption should be factored into the national climate change projections of any densely populated country, he said. A couple of years ago I posted an article about waste heat. Compare this map of CRN temperature changes from a WUWT article to the population growth map. 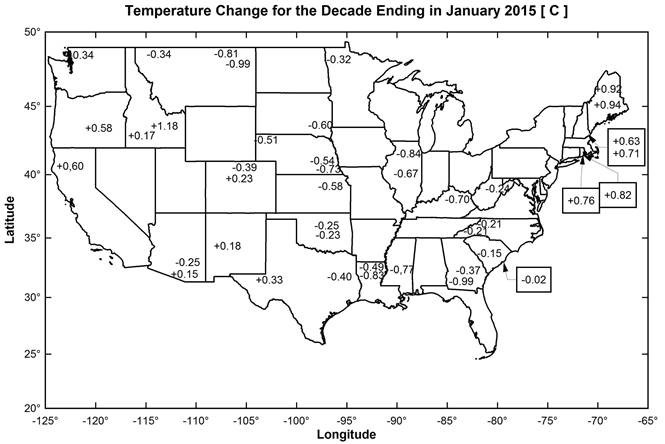 A large part of the US is shrinking population-wise and that part of the USA is cooling. G.J. Zhang, M. Cai and A. Hu. Energy consumption and the unexplained winter warming over northern Asia and North America. Nature Climate Change. Published online January 27, 2013. doi:10.1038/nclimate1803.